I missed a couple of posts – apologies, but I’ve been quite unlucky of late with my recipe choices neither of which will feature on this site. Bad and bad – firstly a dreadful parsnip puree I had on good authority was delicious, instead was a rancid metallic nightmare. And most recently Balinese duck – which looked lovely in the book, sounded delicious. Instead, it turned out to be a pile of dry old duck meat, half a litre of duck fat, alongside a sour and greasy sauce filled with bits of whole spices to pick out of your mouth. Not good. I was beginning to doubt my cooking abilities. Until tonight. It came in the form of a delicious Spanish chicken dish. I do love garlic. Imagine the surprise when I discovered this dish contained some 16 cloves. You may think the resulting taste would be overpowering, but because of the time it cooks for it mellows considerably into a wonderful, rich sauce. It’s one of Spain’s best chicken dishes and a national treasure to boot – not to mention my cooking saviour. Heat the olive oil in a casserole pan over a moderate heat. Sprinkle a little salt over the chicken breasts then fry them for 3-4 minutes each side until browned. Add half garlic and the 2 bay leaves and stir for 1 minute. Pour in the brandy. If you’re feeling daring, step back and ignite. When the flames die down add the wine. If you’re not, just simmer the brandy for 30 seconds then add the wine. Reduce the heat to low, cover and simmer gently for 35 minutes. With a pestle and mortar mash together the remaining garlic with the parsley, salt and pepper until smooth. 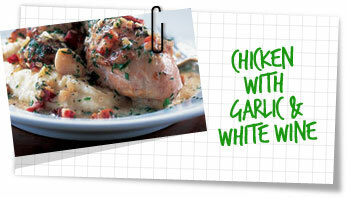 After the chicken has cooked for 35 minutes, stir in the garlic mix and simmer for a further 15 minutes. Check for seasoning before serving. Serve with some green vegetables and most importantly, mashed potatoes to soak up the amazingly delicious sauce.